Dr. Dan Radecki is the Chief Scientific Officer at the Academy of Brain-based Leadership (ABL), which offers a scientifically validated, brain-based approach for future-oriented leaders and organizations interested in optimizing their performance, relationships and health. Dan also serves as Executive Director of Research and Development at Allergan Inc., where he is a Global Leader for drug development programs. Dan holds a Bachelors in Psychology, Masters in Biopsychology and Ph.D in Neuroscience. Dan has been published in the Harvard Business Review and has lectured internationally on topics such as the neuroscience of resilience, bias, creativity, leadership wisdom, the aging brain, the biology of collaboration and the impact of stress on the brain. Halelly: Welcome back TalentGrowers, to another episode of the TalentGrow Show. This time we talk about neuroscience and how it can impact your leadership ability. So, Dan Radecki is my guest. I introduce him more fully when we get into the episode so I won’t spend anytime doing that now. I am Halelly Azulay, your leadership development strategist here at TalentGrow, and today you’re going to learn about how your brain’s default setting is actually to have a negativity bias and ways you can actually override that, break that, overcome that, through using your higher brain. He shares specific, actionable strategies and techniques and we even get into topics such as intermittent fasting and using a mindfulness app and things like this. So there’s really lots and lots of interesting and maybe slightly different than our usual content here in this episode, so I can’t wait for you to check it out. Episode 75, TalentGrow Show. Hey there TalentGrowers, welcome back. This is Halelly Azulay. I’m your leadership development strategist, and if you listen to my podcasts, watch my vlogs or read any of my blogs, you know that I geek out on neuroscience, and especially applying things from the world of neuroscience to leadership. But, I am not a neuroscientist. Today, I have one to speak with you on this show, and a lot of times when you talk to someone who is a scientist, a lot of people say, “Yeah, but you don’t work in the corporate world and you know what it’s like in academia and in your studies, but you don’t know what it’s like.” But today I have found someone who has actually overcome both of those objections. So I’m really pleased to introduce you to Dr. Dan Radecki. He is Chief Scientific Officer at the Academy of Brain Based Leadership, which offers a scientifically validated, brain-based approach for future oriented leaders in organizations interested in optimizing their performance, relationships and health. But Dan also serves as Executive Director of research and development at Allergan, Inc., where he is a global leader for drug development programs. So Dan holds a Bachelors in psychology, a Masters in biopsychology, and a PhD in neuroscience. He’s been published in the Harvard Business Review and has lectured internationally on topics such as the neuroscience of resilience, bias creativity, leadership wisdom, the aging brain, the biology of collaboration and the impact of stress on the brain. Dan, welcome to the TalentGrow Show. Dan: Thanks so much Halelly. And yes, I do share the pain of being a neuroscientist and a leader, so I’m glad I can fit that bill for you. Halelly: Yeah, that’s a unique pain. Well, we hope that today when we speak together and share some of your knowledge, you will help alleviate some of the pain that I know a lot of people are experiencing, both in their work relationships and in their personal relationships that come from things that we actually now can pinpoint because of this budding field of neuroscience. But before we go there, I always like to ask that my guests give us a very brief memory lane journey of where did you get started and how did you get to where you are today? Dan: Sure. As you said, I started off in the field of psychology, and I got really interested in the nuts and bolts of the brain. That’s really neuroscience. I finished my PhD in neuroscience, and really focused and what I did my dissertation on is the impact of stress on our behavior, on the brain. We know stress does a lot to the body, but we really don’t know what it does to the brain. So I studied that a lot. Got interested in that, in the field of anxiety and depression, and started working in the corporate world in biotechnology and pharmaceutical industry. After being in the corporate world for a few years, I was always amazed at how blind leaders were to their biases. I’m talking about leaders at the top. Simple things like emotional intelligence. The mantra was emotions shouldn’t be in the workplace and we shouldn’t have to deal with them or talk about them. Things that I took for granted as a researcher, understanding the brain, it seemed like there was a big disconnect between what leaders were doing and what we knew about how the brain works. After that frustration for a few years, I one day found this group called the Neuro Leadership Institute, and it fascinated me because of this idea of neuroscience and leadership was something that I thought about for years. So, I got involved with the Neuro Leadership Institute. They asked me to create an educational program to really get to people who are burgeoning leaders, people who are starting out in the leadership field, and teach them about how our brain drives our behavior, with the end result being becoming a better leader, building a better model of leadership. I put together this graduate certificate course, and that interest in it by a lot of students drove actually a Masters program. We got accredited by University of London in the neuroscience of leadership. What struck me over those years, when I was teaching these students, was how diverse our audience was becoming. We went from coaches and HR leaders to high school teachers and all the sudden we had students enrolling who were just parents, police officers, even an assembly line foreman. So what struck me was leadership is this really broad term, and it’s applicable to really, virtually every aspect of our life. We started to branch out. Shortly there after, I moved on to co-found what you mentioned, the Academy of Brain Based Leadership. We really wanted to build a group that could focus on educating leaders, whoever that may be, to become more self aware, and to manage the limitations of our brain. Because we have a lot of limitations that are imposed upon us by this old brain of ours. So, the goal is we want to enhance our performance, both your personal and your professional. You can’t really, when you talk about the brain, your ring your brain everywhere. You bring it to work, you bring it to home life. They go hand-in-hand. Really, our push now, our passion in our group is to get this information to the next generation. Not only the Millennials, the new group trying to be leaders in the future, but to kids. Bring this into schools, to youth activities, at a level which they understand to make a difference. So that’s really where we’re at now. Halelly: That should help prevent a lot of the kinds of problems and pains that a lot of us experience in the corporate world when there are kids, you’re helping them see the light sooner and earlier and develop the right kinds of skills earlier in their life. It should certainly help them, but it’ll help everyone that they lead in the future. Thank you for doing that work. Dan: Can you imagine if you went through puberty with some of this information? That would be something. Halelly: It would help! It would help make sense of so much of the mystery otherwise, where you go, “What just happened?” Well, good for you. You’re doing good in the world. I spoke at a conference in May where you were also a speaker and I went to see your session and really enjoyed it, which is how I decided, “I’ve got to bring this to the TalentGrowers community.” You talked about how the brain dictates behavior, and when we understand the intersection of how the brain interacts with, or creates our emotions, our biases, that leads to a certain lens we look through. The more that we understand that – and this is the work you’re doing now with the young people as well – the better we’re able to function. So, there is so much we can talk about, but in this short format that we have together, I’d love for you to unpack the big picture view of what it is that you know about the brain that can help us as leaders. Dan: Sure. I mean, I think the best way to do it, the way actually we like to learn, is to keep the story simple. As I said, we teach this to 8-year-old kids and we teach this to CEOs. 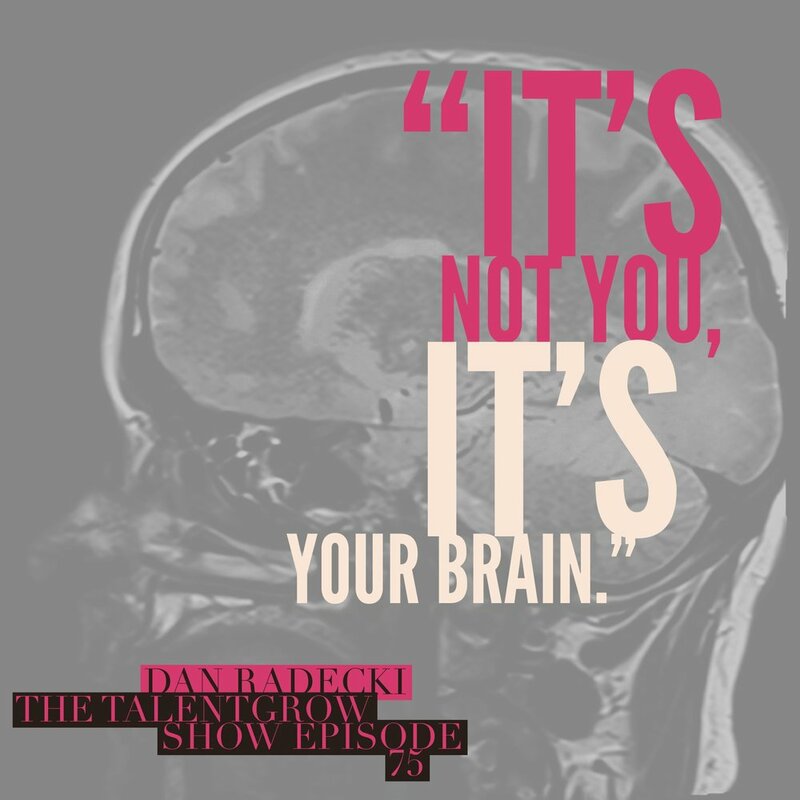 Think of a simple idea, and this is a mantra that we use all the time, which is, “It’s not you, it’s your brain.” It sort of gives you leeway to rationalize and explain some of the things you’re going through by the fact that it’s really not your fault. It’s a simple story. 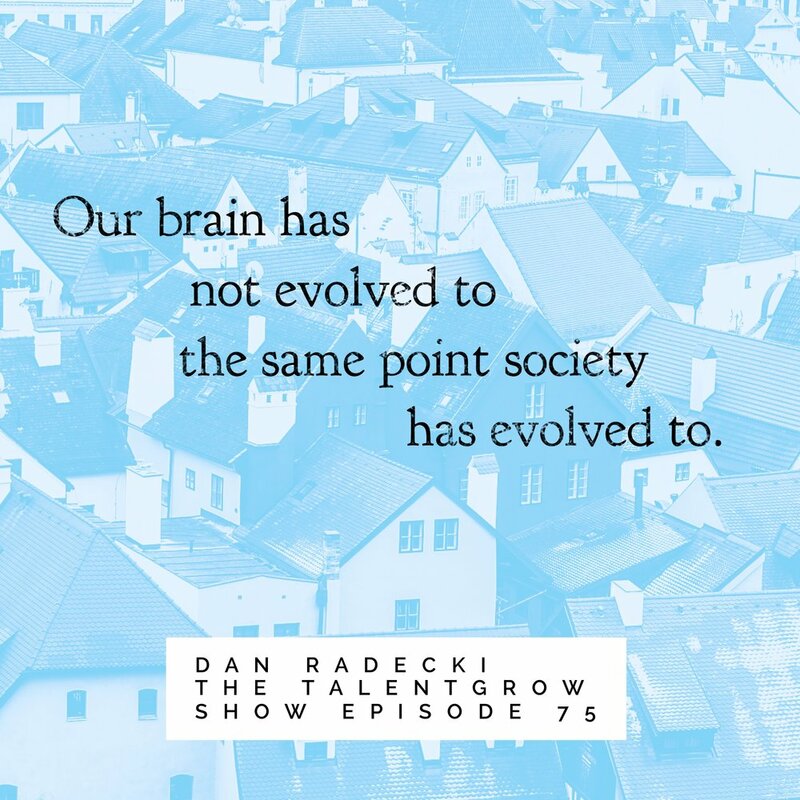 Our brain has not evolved to the point society has evolved. If you think about how society has evolved, just in the past 1,500 years – our society has changed tremendously. We’re at a point now where we don’t necessarily have to worry for the most part about day-to-day survival. Where are we going to get our food, our shelter, is someone going to attack us for our resources? The vast majority of the time our brain was evolving, that wasn’t the case. Our brain literally evolved, developed, wired itself, under this environment of constant threat. We had to be aware that there was threat out there everywhere. There’s a problem, a disconnect. The way our brain is wired, the way our brain sees the world, is different than our world is today. Our society is much more advanced. But we’re still left with some of these operating principles of let’s call it that old brain. They’re not really adaptive today. They were adaptive at one point. Let’s say thousands of years ago, if you saw a stranger, someone who was different, and they were approaching your tribe, that was a threat. Because most likely, that stranger who you had never seen, wasn’t part of your tribe, they were there to do something, to take something, that wasn’t theirs. It was a danger. That’s how our brain evolved. That danger, that threat, is still engrained in our brain. Even though it’s not as adaptive today. We’ve got a multi-diverse, cultural world, where we see people who are different from us everyday. However, that old brain, at a very low level, because this is how it evolved and how it still is, senses a threat. The bottom line is, our brains default – and this happens to all of us, and to some more than others – but our brain’s default is to have a negativity bias, a threat response. Our brain is really good at noticing and reacting to threat in our world, very quickly. That’s our primary concern, and this happens, we don’t realize it. It’s engrained to our brain. We call it below the level of consciousness, or non-consciously. We’ve got this old brain that wants to see threat in everything, and it wants to, to some extent, automate these responses. So this is where biases come in. We have biases – and again, it’s not you, it’s your brain. Biases are adaptive. Our brain created biases for a reason. They were mental shortcuts, it allowed us to act quickly when we needed to. If we saw someone or something different, we assumed it was a threat, because that was our best chance of survival. We have these biases, and just think of these biases when you hear about it, as a mental shortcut. It’s your brain, bypassing us needing to think about something. It just reacts. When we talk about biases, one of the things that we talk about in terms of first of all recognizing them, is understanding that you have this old brain. We’re still saddled with this old brain and it’s going to react to these biases. We’re all going to have these biases to some extent. We like to say if you have a brain, you’re biased. But, we do have as humans a unique ability to manage these biases, because we do have this higher brain, what we call the prefrontal cortex. So we have the ability to manage these biases, and it’s just becoming – that’s why self-awareness is so important – it’s becoming aware of that we have these biases, and what our particular biases are. We all have sort of a lens that we see the world through, and if you can become self aware of that, remove the blinders, then it goes a long way to understanding and mitigating against some of these things. Halelly: And some of the work that you’re doing, and a lot of the folks in the field of bringing neuroscience to leadership and to relationships is to help us build maybe bridges between that very ancient brain that’s constantly focused on threat and safety, and this evolved brain, this rational brain that we have in the neocortex, that helps us make solid decisions about how to act, rather than just to act from a knee-jerk reaction based on these biases. Dan: Yes, and one of the ways to remember it, we use this analogy all the time, which is it’s sort of a yin-yang relationship. You’ve got this old brain I mentioned, which wants to focus on threat, and you do have this higher brain which is sort of unique to humans, which allows us to do these amazing things like plan for the future and put ourselves into someone else’s shoes, take someone else’s perspective. When you talk about biases and this whole idea of resilience, brain resilience in general, the idea is to build up the strength, the integrity, of that higher brain, so that it can act. It literally acts as a brake. We use the analogy, if you have this visual of your higher brain is a brake, and it’s acting as a brake on that old brain, that negativity brain, and what does a brake do? Say you’re going down a hill out of control in your car, you put on the brake so you can gain some control of your vehicle so you don’t crash. That sort of is what this higher brain, you said neocortex, we call it the braking system. It allows us to control that older brain, our emotional, our instincts, and so one of the things we talk about, we’re never going to get rid of this old brain response. It’s been wired into our brains for literally a million years. How can we manage that brake, to keep that brake really strong, so we can in the moment not be a slave to that older brain. If someone annoys us, if I’m in the grocery store and I’m in a long line and I’m becoming annoyed because I’m late for dinner and there’s 12 people in front of me, and the sole reason it’s happening is because the checkout clerk is talking to people and not doing her job, I can get really angry. I could start to scream, throw things, at my frustrations. That’s that old brain. We have this higher brain, this brake, that allows me to stop and take a moment and pause and say, “Okay, here’s the situation,” and I could reappraise it. I could start using that higher brain and say, “Maybe this clerk is lonely. Maybe she doesn’t have anyone at home and this is the only opportunity she gets to talk to people. So actually, this is helping her.” This is called reappraisal. It’s a way of using our higher brain to sort of diffuse that negativity or lower brain. This is the thing we talk about in terms of how you manage these biases, is building up that brake. There are techniques we can talk about of how you build up that higher brain, that brake, and the research is showing if you can do that, you can really become emotionally intelligent. And you can really not have to be at the whim or a slave to that older, negativity-biased brain of ours. Halelly: So it sounds like one thing you’re trying to help people do, and everyone can do, is that we can learn these techniques that are braking techniques, like reappraising, that we can then practice using in the moment to override those reactions, those sort of instinctual reactions we have, and choose differently. Dan: Definitely. There’s even, to take that a step further, so there are some of these … reappraisal is a good one, labeling is another one, just naming the emotion. These work in the moment, but they take effort. It does take effort. Our desire is when you get mad, you hit someone, or you yell, or you become emotional. It takes a little bit of an effort to step back and pause. What we also like to do to take it a step further is to teach strategies or practical ways to build that brake over time. The ultimate goal would be, “I don’t have to use so much effort to step back and not yell or scream or hit someone. Because my brain has literally rewired itself to not be that way.” So we can do that. The research is pretty interesting. Some of these techniques, where you can build that brake. Halelly: So rewire. That’s creating new habits, I guess that’s what you mean by that? Dan: It is. 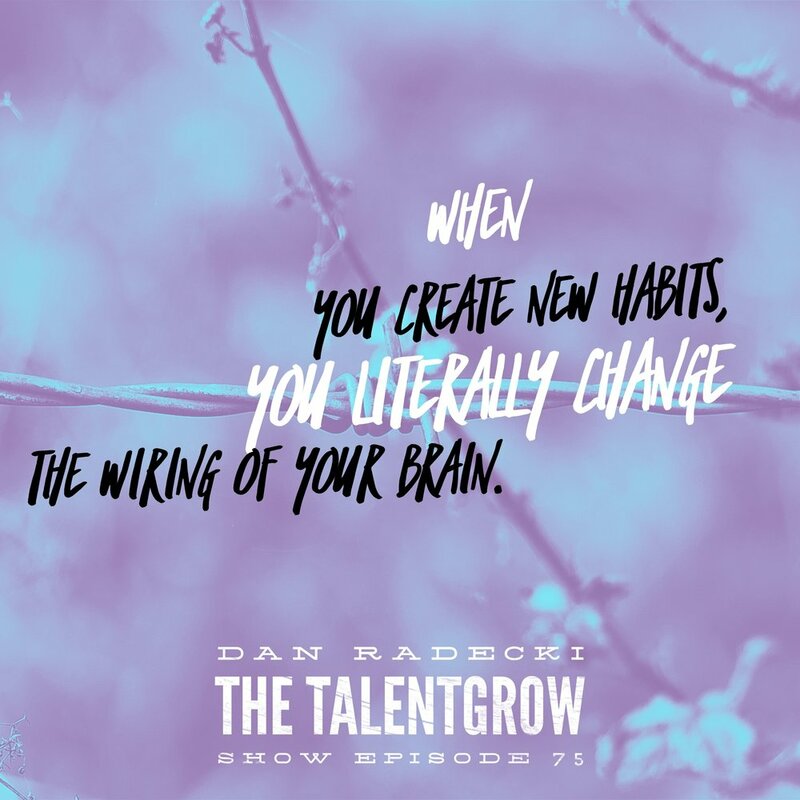 And when you create new habits, you literally change the wiring of your brain. We can physically see this. It’s pretty amazing. Halelly: That is amazing. I’d love for you – I know we can’t probably get all the juicy, great techniques that you have – but share maybe one or two others that listeners can try. Dan: I love talking about this, because as a neuroscientist, I’ve been studying this for about 25 years. If you would have told me 25 years ago some of the stuff we know now about the brain, the mind-brain connection, you would have been laughed at. For example, there’s a lot of research now around mindfulness training. If you don’t know what mindfulness training is, think simply almost like meditation, being in the present moment, clearing your head of that internal chatter we have and thoughts, and just being present. Mindfulness training is a big thing now. It’s gone mainstream. What we found with mindfulness training, if you do it regularly, it can actually cause that brake of yours, that braking system, to become stronger. All other things being equal, you won’t need as much energy to activate that brake as you would if you didn’t do this mindfulness training. It actually becomes more efficient. Halelly: Because it allows you to be more aware in the moment of what’s going on, rather than allowing it to sort of go on behind the scenes or in the background or the program that’s coded in there. Dan: Exactly. You used the term I think self-awareness at the beginning, and that’s a big part of this. The self-awareness part. When you are in this mindful state, one of the key characteristics is you’re not judging things that are going on in the moment. You’re just being a part of it and accepting, and that seems to allow us to step out of that old emotional brain. Halelly: Got it. You can probably say a ton about stress. I know that’s something you really look into. What can you share with us about the impact of stress on leadership ability? Dan: Oh, gosh, yeah. There’s a lot! Again, this is a field that is exploding in neuroscience and health in general. Stress, I mentioned, we know a lot about what stress does to the body. We’re just finding out what it does to the brain. The top line is that stress causes literally, we can see this, physical changes in your brain. In that brake that I talked about, the higher brain, the one that allows us to sort of put a damper on our lower brain, that old brain, stress, over time, can actually cause that higher brain, that braking system, to become weaker. We can look at neurons in that braking system in the higher brain and see atrophy, see shrinkage of the neurons, of the connections. The end result is that brake does not become as efficient. Think about what happens, again, that car analogy. If you’re going down a hill at a high speed and your brakes go out or your brakes start to weaken, you’re not going to be able to control that car as much. That’s sort of what happens in the brain. If you don’t have a strong, fully-functioning braking system, we’re going to be at the mercy of that old, negative brain. And we’re not going to be able to take a pause. I’m not going to be able to control myself in that grocery line. I’m going to start screaming and yelling at people and throwing stuff. Because that braking system, that thing that allows us to be uniquely human, it’s not totally online. Stress really has an impact on that, and that’s something that we didn’t realize just maybe up to 15 years ago. Halelly: Wow. You know, I think to me it seems really intuitive that if you’re currently in a stressful mode, you’re obviously going to have a much harder time being empathetic to someone else or trying to see it from their perspective. We’ve all been there where if you’re stressed out, you’re not as good at listening or having a good conversation with another person as when you’re calm. What I’m hearing you say, I think, if I’m getting this right, is that it has a lingering effect, so if you’re under stress a lot, it wears down the system such that even when you’re not currently stressed out, your brakes don’t work so well, even when you’re calm. Dan: Exactly. I mean, yes, there is that acute in-the-moment stress that we’ve all had and that’s one thing. The chronic stress, and this is actually where it becomes scary. My other life of doing biomedical research in the field of depression and Alzheimer’s and things like that, was starting to make linkage between chronic stress over years and dementia, Alzheimer’s, Parkinson’s, and so all these brain areas connect. So like you’re saying, if you have the cumulative effect, it starts to wear down that brake so that even if you’re not in a stressful moment, you’re still going to have issues dealing with that lower brain. It’s not just the emotions. We do know that this braking system helps us focus, it helps us distract, things that are trying to vie for our attention every moment in the environment. So I’m not able to be attentive and focused, if that braking system is off line. I’m not able to be creative, and your performance is going to suffer. Your general memory, your learning, all these higher-level things are going to suffer. Bottom line is, if you’re a leader and you’re under chronic stress, you’re not going to be your best. You’re not going to have that higher brain, your memory, your creativity, is going to suffer. People are going to notice. The way you interact with people is going to be very much different. Halelly: What makes it worse is that if you’re a leader and you’re under chronic stress and you’re doing all this, you’re probably causing everyone you lead to then be in a chronic stress mode and you’re wearing down their ability to think straight and focus and do all that good stuff that you hired them to do. Dan: And this is one of the first things I encountered in the corporate world, as a leader, seeing that. Seeing the effect, there’s something in science called emotional contagion, which means if someone is stressed and they’re emotional, it sort of has an effect on those around them. We’re starting to see in science how this happens, and yes, it’s almost like a downward spiral. Me as the leader, I’m not managing my stress. It’s having an impact on all these things we talked about. It affects the people around me. We’ve actually done studies where if someone is under a tremendous amount of stress, and they’re not even showing it outwardly – they’re suppressing their stress – so outwardly they seem fine, the people around them have increased blood pressure. It’s amazing. This is what’s so interesting about neuroscience. There’s so much we don’t know. We have ways that we still don’t know how it happens to pick up on these emotional cues and what people are going through, and it affects us. It affects our physiology, our brain. Halelly: That’s amazing. Wow. It sounds very depressing, and I might need your help from your medical company! We don’t have a lot of time left. Let’s leave people on a high note. What can we do? What are some things we can all do to try to stop this vicious cycle? Dan: Yes, it’s not all bad news. The problem is we’re all exposed to stress. I said before, it’s not you, it’s your brain. There’s a reason why we have stress. It’s actually good for us. We need a little bit of stress to be properly motivated. Too much is the problem. We can’t eliminate all of our stress, so think of the other end of the spectrum. How do we build up that braking system so we can manage it in the moment? A couple of ways. I mentioned mindfulness training. Probably the second biggest field of research in this regard for building up that braking system is exercise. Exercise actually increased these natural chemicals in your brain, we call them growth factors, that allow your brain to heal itself, to clear out all these free radicals and things that happen because our brain is really active, and actually help your brain repair, build, it’s almost like housekeeping. So exercise seems to be able to counter some of the damage stress does. So there’s mindfulness, there’s exercise. Nutrition is a big area of interest. Specifically, when I say nutrition, fasting. There’s some fascinating research by the National Institute of Health suggesting that intermittent fasting can actually activate a switch in your brain, an old evolutionary switch, that says – this old switch, remember the way things used to be, we never used to have three square meals a day as our brain evolved – there’s this old switch in the brain that when you go about 16 hours without eating, your brain flips the switch and says, “Okay, I could starve. I need to be at my creative, my mental best, to find food.” That switch is still active in us as humans today. This field of intermittent fasting has done research showing that when you go about 16 hours or so without calories, that switch flips, it activates some of these chemicals in the brain that, again, help us clear out the free radicals, do housekeeping, and make it so we’re optimally focused and attentive. Halelly: l love it. I bet we could also talk about sleep. I know that I’m reading a lot about how sleep is another place where we do a lot of housekeeping of toxic elements in our brain, right? Dan: And sleep, we also are finding that we think dreaming is a way for your brain to sort of triage and figure out what to do with all the stuff it took in during the day. I used to work in a sleep lab, and it was amazing – when you stop someone from dreaming for two or three days, they start to hallucinate, they can start to become psychotic, and we never knew why. We think now it’s because your brain needs that sleep to be able to manage all of it. And the research is showing if you don’t get that proper sleep, you can’t manage stress. It’s pretty clear. It’s pretty scary, actually, when you look at the generations coming up, how little sleep they get. Halelly: Yes. I have a 20-year-old who is sleeping right now because he was up all night! That’s a different story. Well, this is fascinating Dan. I really appreciate it and I’m really kind of uplifted and excited that you mentioned things that I think are kind of out of the realm of what people think about that they should be doing to be a better corporate citizen and a better leader in their workplace, but they’re very doable and very personal. Every person can do something to move themselves closer to reducing stress, to being a better leader, so I appreciate that. What’s new and exciting for you on your horizon? What’s got your attention these days? Dan: Probably the biggest excitement is some of the research that’s coming out, linking our physical needs and our physical brain and our social brain. We used to think that being social, being able to talk to people and communicate and be in relationships, that was something that you learned. Now were finding that we actually have a part of our brain dedicated to being social, to relationships, to being part of a group. We never knew that. And so finding that you have this social brain, there’s some fascinating research about how important our social needs are, as opposed to our physical needs. Some of you may remember Maslow’s hierarchy of needs, which stated at that the lowest level you need food and shelter. We’re finding out these social needs are just as important. There was this amazing research done showing that the same area of the brain that deals with physical pain, like if you break your ankle, that area of the brain is also active when you have social pain. Say someone dumps you, your spouse dumps you. That are of the brain is still active. Social pain and physical pain are activated by the same area of the brain. They actually did researching saying, “Okay, if that’s the case, what if you took a drug that worked for physical pain, like Tylenol, would that work when you feel social pain?” And they found out that actually was the case. People took Tylenol, that social rejection and social pain went away. Again, this field of neuroscience is a great field because it’s sort of the last frontier, this brain of ours, and this stuff we’re learning everyday that’s turning our preconceived notions upside down. Halelly: Really neat. And exciting. There’s so much. I mean, a brain is small when you look at it, but it is infinite and so complex. So there’s so much more to be done. Thank you for the work you’re doing. What’s one specific action that listeners can take today, tomorrow, this week, that can help them move closer to being a better leader based on your perspective? Dan: Simply try a mindfulness exercise. As I said, these days – and this is different than even 10 years ago – these days it’s mainstream. You can go on your smartphone and download a mindfulness app for free. Try it. Try it for 30 seconds. Sit quietly and try to clear your mind of any thoughts or sounds or bad 80s music that is going through your head, things like that. Just try to clear your mind and have nothing going through. It’s hard! Our brain doesn’t want us to do that. If you can do that, and build off, it’s like an exercise. You build up and build up. If you can do that, then you’re going to be on your way to really strengthening that braking system and being able to catch yourself in the moment, and not be so susceptible to these biases. Halelly: Do you have any favorite apps that you suggest people use, like Headspace or Calm? Which ones do you like? Dan: I think Calm is good. There are some that are based on the mindfulness. There’s a technique, specific for stress, mindfulness-based stress reduction program, and these are courses you can take. But now it’s so simple. It’s hard to do, but the technique to do it is so simple. I think any of the apps, if you’re not doing it now, anything is better than nothing. So Headspace is pretty good as well. That may be a good one to start with for beginners. Halelly: Great. And we’ll link to those in the show notes. Well, time is up and I’ve really enjoyed speaking with you. I hope that listeners have enjoyed getting some of those interesting nuggets of insight, and how can they continue learning from you or stay in touch with you? Are you on social media? I know your business has a website and we’ll link to that. What else would you like to suggest people do to stay in touch? Dan: The website is great. We actually have a course and it’s self-paced. We do this all with the brain in mind, as we say, so it’s a series of live recordings and then every week one-on-one discussions with us about the content. We dive into what we just talked about in much more detail. Halelly: Wow. Cool. How can people find that, is that on your website? Dan: It’s on the website. It’s called the Brain Based Leadership Course and it’s on academy-bbl.com. Academy of Brain Based Leadership website. Halelly: That sounds interesting, fascinating. Dan: By the way, if any of your listeners are coaches, we now get continuing education credits for the ICF. Halelly: Awesome. Very good. Are you active on social media? Do you tweet? Are you on LinkedIn? Dan: I’m on LinkedIn, yes. Tweeting, with my two jobs now, it’s difficult to do too much on social media. But I definitely am on LinkedIn and the website. Halelly: Very good. We’ll link to that. Thank you so much for your time and your wisdom, sharing that with us, the TalentGrowers community. We appreciate you so much. Thank you Dan. Dan: Thanks so much, appreciate it. Halelly: I hope you enjoyed this episode, TalentGrowers. I’d love to hear what you thought, as always. I’m very, very interested and open to your feedback, and I certainly hope you take what Dan suggested into an actionable mode, so that you can actually begin to apply what you learned and make full use of this opportunity to improve your own leadership skills. Really, it’s not just about leadership. It’s about being a better human, better relationships in all your areas of life. And, I hope that you will build your relationship with me by getting in touch through signing up for my weekly newsletter. I give you a free guide called “The 10 mistakes that leaders make and how to avoid them,” as a bonus for that, and it’s easy to sign up right there on my website where the show notes are and the links to everything we discussed. That’s going to be at TalentGrow.com/podcast/episode75. And my weekly newsletter is super short, very informal, always includes a link to the latest podcast and any other kind of news and actionable tips from me, and some of my friends. I really would love for you to sign up. It’s completely free and it will help you always be in the know and never miss an episode. Thank you so much for listening. I really appreciate you. This is Halelly Azulay at the TalentGrow Show. I’m your leadership development strategist, hoping that you will make today great.